When using a PC, right click on the App Icon and select "Save target as". You will then be able to save pdf Apps to your computer /device. This app includes; Arts and Crafts, Art Nouveau, Cubism, De Stiyl, Bauhaus (Modernism), Art Deco, Pop Art, Studio Alchimia and the Memphis Group. This app includes: What is Technology Push? What is Market Pull? Brand Identity, What is a Trend? What is Copyright? What is a Patent? What is a Registered Trademark? This app includes: A range of issues faced by designers, manufacturers, consumers and Governments - relating to product design, manufacture and the environment. This app includes: A Range of Companies - Alessi, Apple Incorporated, Harley Davidson Motorcycles, Tesla, David Constantine and Motivation, Zaha Hadid Architects. This app includes: What is Primary Data? What is secondary Data? Examples of Primary and Secondary Data Collection, What is Market Research? How Market Research can be carried out. This app includes: Shading Flat Surfaces, The Line Technique (Flat Surfaces), Shading Curved Surfaces, The Line Technique (Curved Surfaces), Coloured Pencil Shading Exercises, Shading technique for Natural Wood. This app includes: Using Felt Pens (Fine and Brush Pens), Video Demonstrating Fine and Brush Felt Pens, Drawing a Craft Knife (exercise stage by stage) Including Felt Pen Rendering, MP3 Player - Draw and Render, Video Demonstratiung the MP3 Exercise. This app includes: An Introduction to Third Angle Projection, Adding Dimensions, How to Draw in Third Angle Orthographic, First Angle Orthographic Projection. This app includes: Isometric Drawing and Designers, Isometric Projection - an Explanation, Drawing an Isometric Cube, Isometric Grid Paper, Drawing Isometric Circles, Drawing Isometric Cylinders, Isometric Exercises. This app includes: An Introduction to Oblique Projection, How to Draw Basic Shapes, Circles and Cylinders in Oblique, Drawing a Camera in Oblique. This app includes: An Introduction to Single Point Perspective, How draw in Single Point Perspective and a series of more Advanced Exercises. This app includes: An Introduction to Two Point Perspective Drawing, How to Draw in Two Point Perspective, A Series of Exercises, from Basic to more Complex. This app includes: An Introduction to Estimated Perspective Drawing, Three Exercises (increasing in difficulty). This app includes; Mechanical Systems (Springs), Pheumatics, Hydraulics, Flywheels, Batteries, Energy Saving Devices and Large Scale Energy Storage Systems. This app includes: The World Distribution of Natural Woods, the Preparation of Timber for Commercial Use (rough sawing, seasoning and planning), Stock Forms and Sustainable Forests. This app includes: Extraction of Iron Ore to the manufacture of Iron Ore Pellets, Where is Iron Ore Mined? The Blast Furnace, The Modern Converter Process (steel) and Stock Forms of Metals. This app includes: covers Crude Oil to Polymers and Plants to Bioplastics. This app includes: Sustainable Forests, How Paper and Card are Manufactured, the Structure of Corrugated Card, Composition of Laminated Card, Card and Board - Stock Forms. This app includes: How Polymers are Manufactured, Thermoplastic Elastomers, Nylon (polyamide) and Polyurethane and Foam Rubber. This app includes: Workshop Tools and Equipment, Basic Manufacturing Techniques, Standard Components, Seals and Sealing Techniques, Binding Techniques. Stock Forms, Standard Fittings and Components( screws, bolts, dowel, nails and hinges), Workshop Tools and Equipment (drills, drill bits, files, glass paper, planes, coping saw, back saws, fret saw, chisels), Machines and Power Tools (woodworking lathe, router, sanding disc, steam bending, veneers, palm sander, hand sander, table circular saw, hand held circular saw). 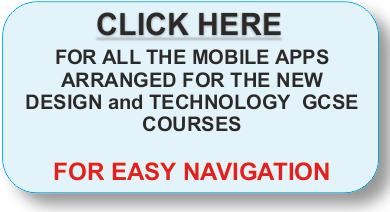 This app includes: Stock Forms, Standard Fittings / Components (pop rivets, cold rivets, screws, bolts, split pins, lock nuts etc...), general Workshop Tools and Equipment (drilling, hacksaw, junior hacksaw, machine hacksaw, punches, buffing, files), Engineering Machines (centre lathe, horizontal miller, vertical miller, shaping machine, compression moulding), Casting (Aluminium and Pewter Casting). This app includes: Preparation for Applying a Finish to Woods, Varnish, Wax, Oils, Paints, Shellac, Wood Dye. Metal Finishes - Machine Finishes, Anodising, Paint, Annealing, Oil Blacking, Electroplating, Galvanising, Case Hardening, Hardening and Tempering, Planishing, Lacquer, Poweder Coating, Polishing, and Etching. This app includes: Mortise and Tenon Joints, Finger Joints, Dovetail Joints, Bridle Joints, Shoulder / Rebate / Lapped joints. The first in a series on Joining Materials. This apps includes: Includes; Strength, elasticity, plasticity, ductility, tensile strength, malleability, toughness, hardness, conductivity, absorbency, density and fusibility. The testing of materials for all the properties mentioned above. AND Commercial Testing. This app includes: Polymorph, Shape Memory Alloy (SMA), Hydrochromic, Thermochromic, Photochromic, Hydromorphic, Hydrocarbon Encaspulating Polymers, Aroma Pigments and Phosphorescent Pigments. This app includes: Definition of Composites, Natural Woods, Glass Reinforced Plastic, Carbon Reinforced Polymer, Concrete, Reinforced Concrete, Plywood, Kevlar. This app includes: Knock-Down Fittings, Screws, Nails, Glues for Wood, Glue for Plastics and Super Glue. This app includes: A Wide Range of Symbols - Recycling, Sustainability, Quality, Food Related Symbols, Information and Ingredients and many more. In total, 38 slides of symbols and their meanings. This app includes: Quality Assurance, Quality Control, British Standards and the Kite Mark, Comformite European, Tolerance Checks, Standard Components, Health and Safety and Risk Assessments. This app includes: Carbon Footprint, Replacing the Materials Economy, Environmental Modernism (Ecological Modernism), Designed to Repair and Maintain. This app includes: an introduction to PIC Microcontrollers including software and programming, Inputs-Process-Outputs, Example Microcontroller Circuits.